Good morning/afternoon/evening everyone and welcome back to Mosaic Monday. I'm so happy to be back hosting Mosaic Monday once again after taking a short break, can't wait to hear about what you all got up to last month. I wonder if like me you kicked back, relaxed and enjoyed some down time (very much needed by me after our hectic but oh so happy family vacation in Florida in July). 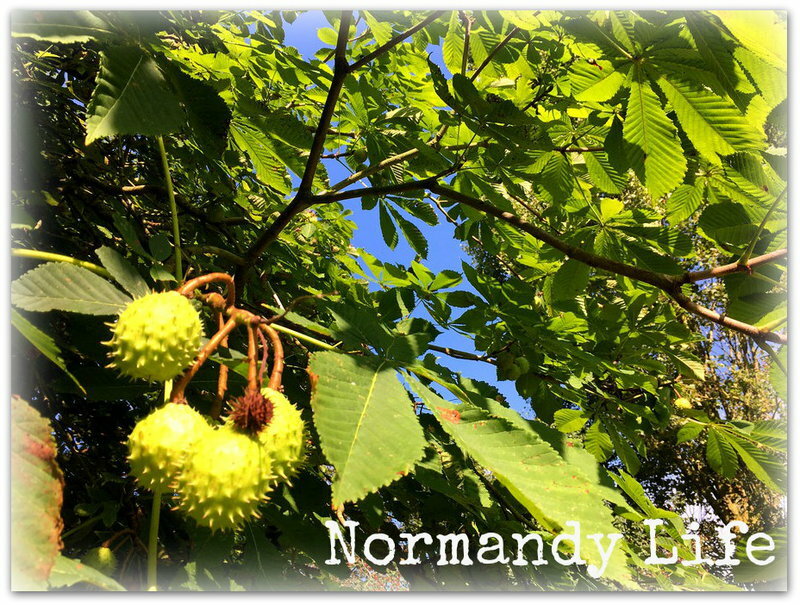 In which case I want to hear all about how your gardens grew; children and grandchildren's visits; cakes you baked and books you read - anything at all to do with la vie quotidienne/daily life. Perhaps August was the month you took a trip to the coast or the mountains or the country or maybe you travelled to a foreign land? So come on, let's share those memories of summer. Bring along your photo mosaics, your beverage of choice and settle in for a catch up. 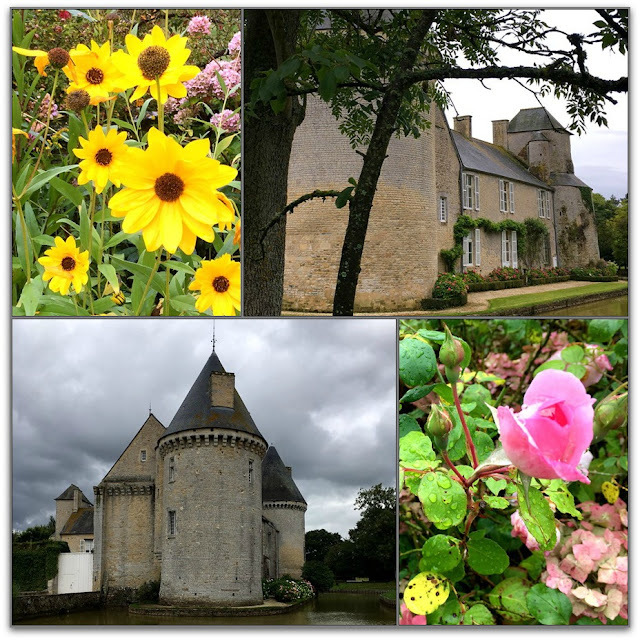 The highlight of our August staycation in Normandy for me was the tour of le Château de Colombières that the SP and I took last week. 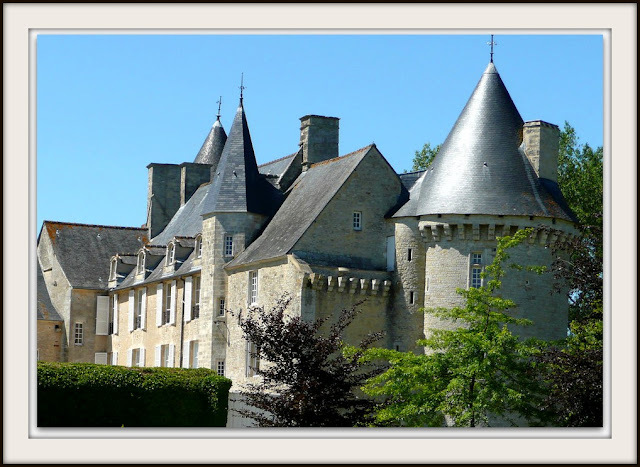 You may remember that I featured the Chateau on a list of interesting places to visit in our area on a blog post several months ago. If you missed that post just click here to see it. I am so pleased that we finally were able to take the tour, our guide (the young woman in the white coat in the photo below) was very informative and told some interesting stories about the Chateau and it's history. 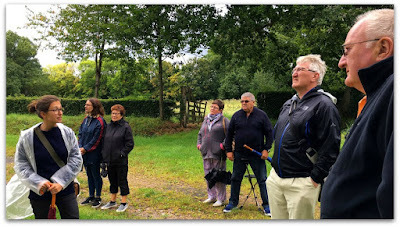 As I'm sure you can tell from the photographs it was a wet afternoon, umbrellas and wellies were necessary accoutrements along with a warm jacket. Unfortunately cameras are not allowed inside the main rooms of the Chateau, so I can only include photographs of the Chateau's exterior, it's gardens and chapel interior in my mosaics. 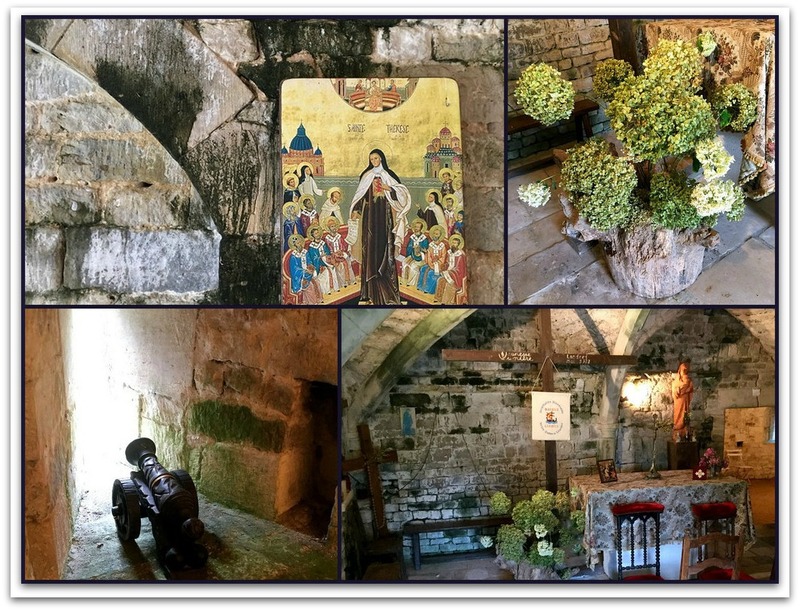 There were some very well behaved young children in our group for part of the tour and the guide was so good at involving them in the Q & A sessions throughout, especially in the Chapel that once was the Guard room. However, there is a video on the Chateau's website which shows the Chateau off in all it's glory, be sure to have the volume turned up! What a loveky chateau to visit. Welcome back. Welcome back to us Maggie, you were missed. I am happy that you wereable to rest, relax and recoup...sometimes that can change everything about how we fell moving forward. I kept some of my favorite shares while you were off meme to share along with some new things that I did during the month of August. Hi Maggie! Well, that's gorgeous! I've never been to France. I think we'll go someday. I've missed you, Maggie! I hope you are gearing up for a lovely fall. Welcome back! 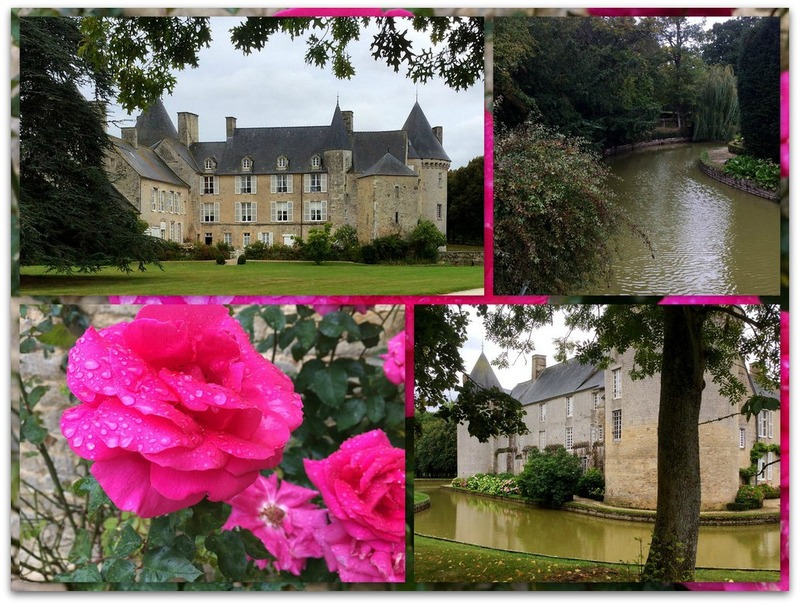 Delightful photos of this beautiful chateau, Maggie. Maggie, it's good to see a post from you and to have Mosaic Monday back up. Thank you! Glad you had a good summer. I know the memories of your family trip are fun to reflect back on. September is here and fortunately for us there is a nip in the air. Of course there is no guarantee that it will stay around. Sometime September can be just as hot as August. Gorgeous photos of such a wonderful trip. Someday I'll get to your part of the world and we will make a list of the must-see things! This would be on it, for sure! Love your redesigned blog, what a wonderful header photo - it draws the eye right in. Hi Maggie, thank you for your 52nd Mosaic Monday. Loved reading about your time away from Mosaic Monday. Hugs. Welcome back Maggie. Looks like your days away were filled with good things. I hope to be back next Monday! Have a wonderful first full week of September! It's so nice to be back, Maggie. Your new header is peaceful and pretty. Thanks for hosting MM once again - it's a weekly highlight. The Chateau looks like a great place for a visit, even if it was rainy. I'll be checking out the video. Have a wonderful September. Lovely header - nice to have you back! The summer was odd, let's hope for a better autumn. 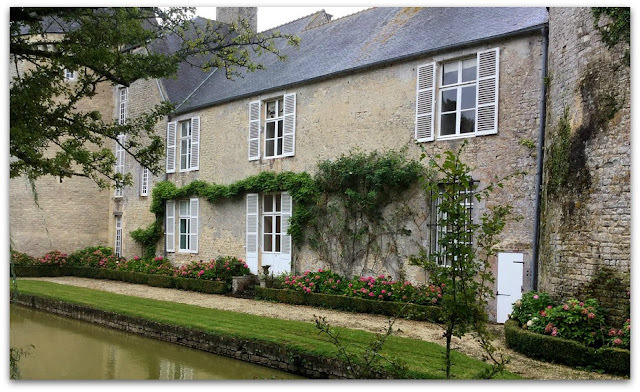 The chateaux de France are always so chic. Welcome back! I really like the mosaic of the interior. I enjoyed the beautiful scene and the atmosphere from Europe. Happy to hear you were able to take the tour of Château de Colombières. If the interior is half as magnificent as the exterior and gardens ... WOWZER! Happy Monday and Thanks for hosting! Maggie, I love the new blog header. Sylvia D.